Monday night was my husband’s birthday and there is no better way to celebrate important events in Memphis than having dinner at Paulette’s Restaurant. Paulette’s moved to Harbor Town in March of 2012. We were at the restaurant for their farewell dinner at Overton Square. Many fond memories were made at Paulette’s. They used to be known for their crepes and Hungarian menu. Since I am a huge fan of Julia Child and especially her crepe recipes, Paulette’s was always a favorite spot to dine for me. Now it is the anchor restaurant for the River Inn on Mud Island with the rolling Mississippi River as a back drop. The Monday night menu is a special treat since it’s a three course dinner for only $19.95. The menu includes your choice of soup or salad, with three lovely entrees to select from and two desserts. Fortunately, we were celebrating my husband’s birthday with another couple, so we were able to sample almost every dish on the menu. Our first choice was a salad or soup. I cannot remember the salad that was offered because no one in our party selected it. 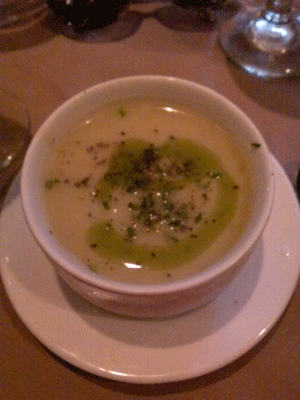 The soup was vichyssoise, a chilled potato soup made of pureed leeks, onions, potatoes, cream, and chicken stock. The unexpected lagniappe, (something obtained gratuitously) for me was the drizzle of pesto olive oil. The flavor was fantastic and made the soup unique. We each had a nice sample of each of the entrees offered on this particular Monday night.The birthday boy chose the Seafood Risotto, which he loved. 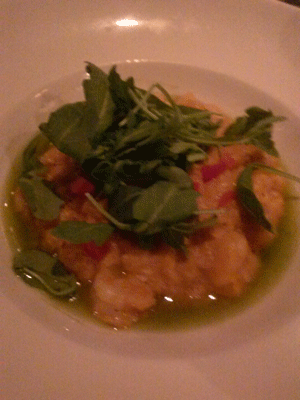 It had that wonderful creamy risotto texture, which is what I love about risotto, and included shrimp and scallops. However, it appeared to have a bit of tomato sauce or tomato paste incorporated into it since it was a reddish pink color. It tasted fantastic. But I was glad that I did not choose this one. 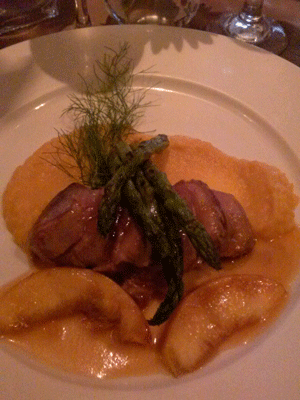 Pork tenderloin with pureed sweet potatoes, roasted asparagus and sliced fresh peaches. Winner – Winner – Chicken Dinner!! My girlfriend chose the chicken entree, which was by far the most beautifully presented. 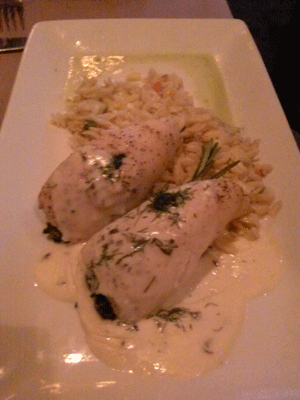 I love the way the chicken breast was served, cut in half and sort of geometrically placed atop the rice and covered with a nice beurre blanc and a sprinkling of chopped parsley. The chicken was cooked to perfection and was very juicy. Evidently, they didn’t mention the sauce on the menu because I’m a sucker for anything covered in beurre blanc. Or maybe I was just biased by the idea of pork tenderloin. . .
Doesn’t the chicken with beurre blanc look luscious?? It was finally time for dessert! Since it was a birthday celebration, the dessert was a very important part of the celebration.The choices were a peach creme brulee (it was peach night) or a chocolate mousse dessert. Would you believe that all four of us chose the peach creme brulee?? We could not wait for it to arrive! This is one of my favorite desserts to serve at my dinner parties. However, I had never made peach creme brulee, and could not wait to taste it. Imagine my disappointment when the server delivered the news that they were all out!! What a blow! They substituted another dessert for the peach creme brulee – you guessed it – another peach dessert. 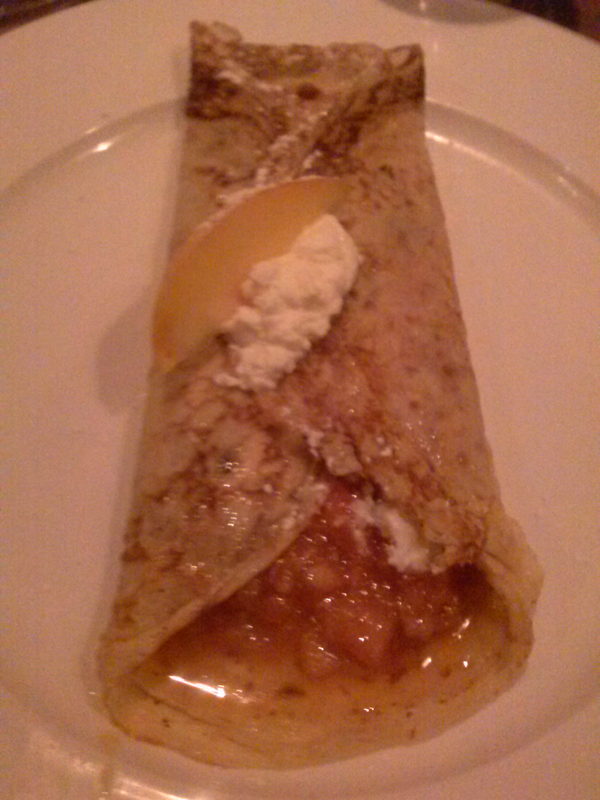 They substituted a fresh peach crepe with whipped cream topping, which sounded divine. However, it was served cold. We were expecting it to be warm with a dollop of cool whipped cream. It was very nice, but could have been so much better had it been served warm. Overall, it was a lovely evening and the dinner was excellent. We enjoyed a nice bottle of Chardonnay, Sterling Central Coast, 2009, which was very reasonably priced and complimented all three entrees. 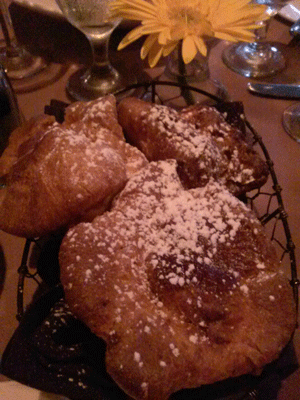 I have to tell you the best thing we ate at Paulette’s was the signature popovers served piping hot with strawberry butter! No matter what else was served, they would still be our favorite item on the menu, as always. We had two each! 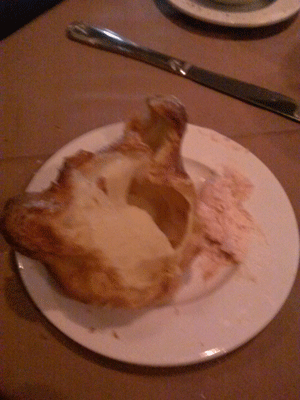 Please note, in case you are planning to go to Paulettes’ for lunch, they do not serve popovers at lunch. Sad face, right? We recently took my Mom for lunch following a doctor’s appointment. She was quite surprised and disappointed that we were unable to get the popovers for lunch. I think they should be available at lunch and dinner. I guess that is a draw for dinner customers. 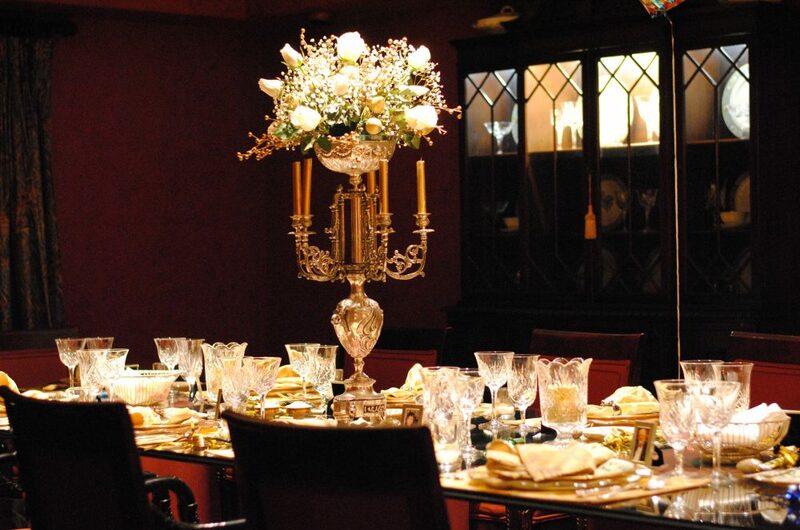 I highly recommend Paulette’s for any celebration or just for Saturday night dinner. Sunday Brunch is also excellent. My birthday is coming up in a couple of weeks, and I cannot wait to go back for my birthday celebration. I’m hoping for the chicken dinner. I will let you know what’s on the menu!